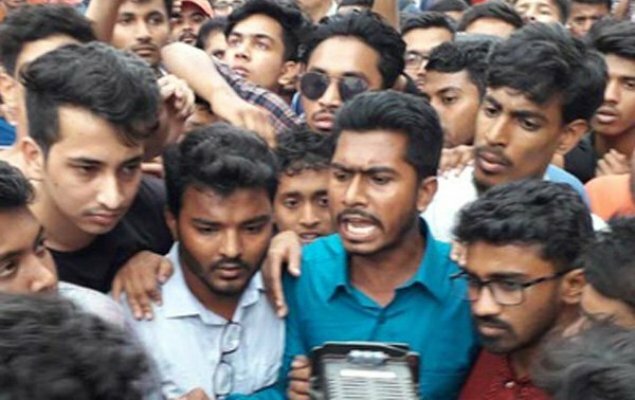 DUCSU VP-elect Nurul Haq Nur on Tuesday expressed his solidarity with the protesters, who demanded justice and safe road following the death of a BUP’s student Abrar Ahmed Chowdhury. Nur urged protesters to carry out their demonstration in a peaceful manner. He also uttered strict warning saying if any move will be taken to disrupt the protest students will give reputable reply to such action. Nur, along with quota reformist leader Rashed Khan, reached at the protesting spot Nadda in the capital at 4:45 pm. Earlier, Abrar, son of Brig General (retd) Arif Ahmed Chowdhury, died in a road crash on Pragati Sarani near Nadda area in the capital on Tuesday morning. Abrar was laid to eternal rest at Banani Graveyard in Dhaka at 4:00 pm on Tuesday.